I was tagged in the "Six Products I Cannot Live Without Tag" on tumblr so here it is for you all. Every one knows how much I love this foundation. I've already done a blog post review on this product which you can view by clicking here and I've included it in so many blog posts like my Best of 2015. I pray that they never discontinue it as it's the best foundation I have ever used, and it's so afforable. I think a lot of the time that people pay for designer foundation (and designer makeup in general really) for the brand name and not the actual product itself. I love Rimmel London's products and their Match Perfection line is just so wonderful. I don't use their Match Perfection Concealer and Highlighter as an actual high lighter as for my skin being so pale it doesn't really work but as a concealer it's amazing. It covers all my redness around my nose and chin, the purple shade I get around my eyes and all of my acne scaring with only a small amount. I am someone who used my concealer and then my foundation, rather than applying my foundation and then concealer, but that personally just works for me and my skin. I picked the Rimmel London Match Perfection Foundation in my local Boot stores for £7.99, and the Rimmel London Match Perfection Concealer and Highlighter for £3.99 again from my local Boots store. I've already done a review blog post on the Max Factor False Lash Mascara which you can read by clicking here, and a blog post of the Beauty at Tesco Be Inspired brand, and it's been mentioned a lot on my blog already like my Best of 2015 blog post. I love this mascara a lot, I was sent it by Tesco and Talk Becky Talk and I love how much this mascara just makes my eyes 'POP' and look big and beautiful. This is my favourite mascara I own. You can pick one of these mascaras up yourself from your local beauty counter at your local Tesco store. 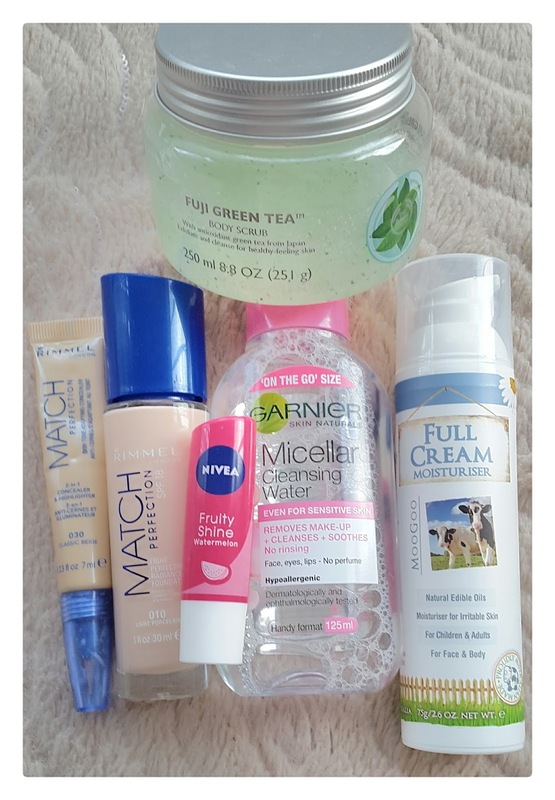 If you'd like to read my blog post reviewing the Garnier Skin Naturals Micellar Cleansing Water then please click here to do so, just like the products mentioned about this product was also featured in my Best of 2015 blog post. Best of 2015 I was sent a bottle of the Garnier Skin Naturals Micellar Cleansing Water to try out and I completely fell in love with it. It's been my go-to cleansing water for almost a year now and I can't find another one that even comes close to matching it. You can pick one up for yourself for only £4.99 at your local Boots store. I first mentioned the MooGoo Skin Milk Udder Cream Repair Moisturiser in my "#LPL Blog Event" blog post as I received it in my goodie bag at the end of the event, and I'm so glad that I did. It's also been mentioned in blog posts such as My December Favourites and My Best of 2015. This moisturiser really is like no other! I suffer from such bad skin on my face, especially around my nose and chin, I get such bad crumbled makeup on my face if I don't use good facial products so I always need to find a great moisturiser that will work well for me and last all day long and make my makeup look great for hours and hours. I've been using this for a couple of months now, it's been my favourite product these past winter months. I've used it everyday since I bought it, and I know I'm going to be using it in the spring and summer months to come as it has Hydra IQ and gives long lasting moisturising in my lips. The combination of watermelon aroma and pigments provides an exciting fruity scent leaving a touch of delicate colour on soft and smooth lips. Skin compatibility dermatologically approved. It smells beautiful, it looks beautiful and it's just a beautiful product all in all. You can buy it from Superdrug for £2.50 by clicking here. I want to tag: Danielle, Sarah and Emily. If you do this tag please let me know by leaving the link below. I hope you all have a really wonderful day!